Read about how Thiago Silva made the move down to middleweight having fought at heavyweight in 2016. 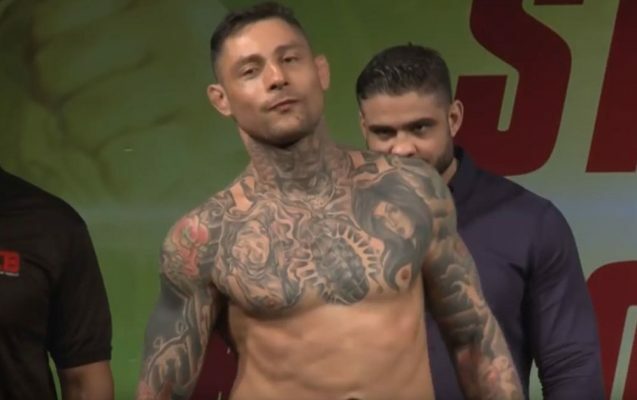 Thiago Silva’s MMA career took a drastic turn this weekend when he fought at middleweight for the first time in his career. After losing his ACB light heavyweight title to Batraz Agnaev at ACB65, Silva teamed up with UK based Combat Nutrition and world famous Dutch fight coach Mike Passenier. This is where the journey to a new Thiago Silva began. The results of working with Passenier were evident almost immediately and Silva’s stand up game improved dramatically and enhanced his aggressive fight style. The rewards of this where seen at ACB 74 Vienna where he finished Daniel Toledo with a brutal 2nd round KO. This was the first fight that Silva worked with Combat nutrition’s Darren Deane from Brighton, England. At the first meeting between the two at ACB65, Deane suggested that Silva should try a drop to middleweight, something that could be achieved with a scientific nutrition plan and without a gruelling weight cut. Taking into account the tough training that Silva was doing, Deane set about designing an eating plan that could suit the bodies daily requirements so that Thiago could drop body fat but also recover for each session. Macronutrients (protein,carbs and fats ) were worked out to suit Thiago’s bodyweight. To cut the bodyfat carbohydrates where only consumed around training times. The primary energy source throughout the day was Thiago’s stored bodyfat. To tap into this energy source we had to go into ‘ketosis’. A method that restricts carb and protein intake but has a high level of healthy fats. This helps the body to burn fat for energy. The results off this were astounding. For ACB74, Silva weighed in below the weight limit of 205 at 203, this just 3 lbs lighter than his Fight against Agnaev, but as you can see the difference in body shape. Following that fight, Silva decided it was time to try a run at middleweight for his next fight in his hometown of Sao Paulo, Brazil. The same techniques were used with the eating plan, but this time water was intake was increased due to the humidity and heat, larger quantities of natural diuretics, Vitamin C and herbal compound Time4 Water loss were used. Silva cut the final few pounds doing sweat session which was overseen by Jaoao Pitbull a longstanding friend and coach of Thiago. Many fighters cut water and then sweat out which can be very dangerous. No matter how many electrolytes or IV’s you have after weigh in the body will only take on so much to keep things level. It will take longer than 24 hrs to recover from dehydration, and the effect on the brain, kidneys and heart can be catastrophic not just from a fight performance point of view but medically too. Deane and Silva knew that a sweat out would be required, hence the large amounts of water that were put into the body. As soon as Silva started his regime, sweat was pouring out of him, but it was only the water that had been loaded so therefore he felt no effects of dehydration. Fight Day Today 🤙🏻#ACB82 @thiagosilvamma looking in amazing shape at 84.4kg yesterday! Last Thursday, Silva hit the middleweight limit of 84.4kg, the lightest he has fought at in his career. The fight on Friday evening ultimately didn’t go his way and he lost via split decision, but at 35-years-old Silva is now arguably hitting his peak physical form. A move back up to light heavyweight looks to be next for the Brazilian, but at least he can rest easy knowing he made a run at middleweight and did so in a safe and professional way.